Normally, all of the road trips that are discussed and posted on this forum, occur in North America... 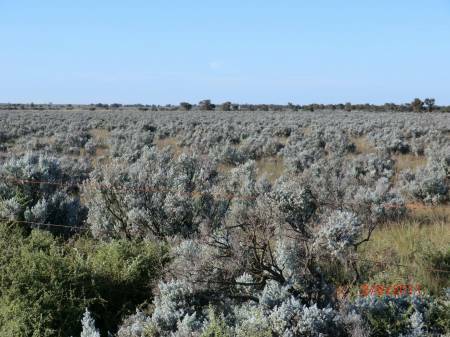 But Lifey is a long-term member and a RTA RoadTrip Advisor and so we are hosting her road trip field reports from a road trip that she is currently on in southern Australia... Enjoy the journey with us! Over half a century of traveling, we have crisscrossed the State of Victoria, every which way. So today the plan was, to just head to the border, and start enjoying South Australia, a State of which I have not seen a great deal. I had not gone 50kms and there was the exit to Mt Macedon, and the memories came flooding back. Memories of the 60s and 70s, when with my mother-in-law, we would go visit the spectacular gardens of the grand homes on that great mountain, just north of Melbourne. I reminisced also over the picnics we would have there in some of the beautiful parks. Mt Macedon stands out with a huge cross on the top, visible for miles. We used to walk up to it. We took our children there. But thinking of Mt Macedon, one cannot avoid thinking of Ash Wednesday 1983, the day so many died and so much of the State was dessimated. (At that time the worst ever, 2009 exceeded it threefold.) On that day most of those grand homes were destroyed, as were so many of their gardens. Also part of the Macedon Ranges is Hanging Rock, the next exit along the Calder (A79). Like Mt Macedon, it is a very popular day trip from the city. Probably best known from the novel, Picnic at Hanging Rock, and as the location of the film by the same name. However, to me Hanging Rock bears a much different significance. It was where we took the children to experience the Total Eclipse of the Sun. Well away from any source of artificial light, it was an experience they have never forgotten. Cannot remember, nor can I find it on the internet, as to which year it was, but I recall they were all quite young.... so probably 1980 or 81 (??). And not all that much further on came the exit to Malmsbury, a beautiful little historic town with some magnificent blue stone buildings... and an even grander bluestone railway bridge. We once hiked to the base of it - ye can't drive there - and took ever so many photos. They just don't make them like that anymore. This was starting to be a nostalgia journey, and that was only the first hour! The freeway on which I was driving by-passes many of the small towns we used to pass through in those days. So when I got to the exit to Harcourt, I could not help thinking of the fresh, crisp, juicy apples we used to buy at the roadside stall. Harcourt is the heart of apple country in central Victoria, and there is no end to the many apple related products available there. Alas, the road no longer goes through Harcourt, and I was left wondering how the orchadists, who so heavily depended on the passing trade, are faring now. By the time I got to Bendigo the freeway had long since ended, and it was two lanes the rest of the way, right through the centre of all the small towns. Around half way to Mildura I came to the areas which had been, and still are, affected by the floods of earlier this year. It was clear that many are not happy with the insurance companies. Large posters were nailed to roadside trees, expressing their feelings. And then it was Wycheproof! I had never been to Wycheproof before... and was quite surprised. Here, in this relatively small town, the train runs straight down the middle of the main street. This is not a light rail, this is the main trainline for all freight, wheat, etc. I have never seen anything like it. There was no fence, just a strip of grass and plants either side of the single track. My mechanic had told me what a 'boring' trip the drive to Mildura is. I can't wait to tell him how excited I was by all I saw... grain stored in huge underground bunkers; magnificent eucalypts lining the road; gently undulating farm land as far as the eye could see; and often I was the only vehicle on the road to enjoy this wonderland. But of course, it did not all go smootly. Before I got to Mildura I realised I had left my map of South Australia - with all my notations on it - at home. Valuable time was lost in Mildura finding the RACV office to purchase another. I had already decided to push on to Renmark, rather than stay in Mildura. However, now that we are approaching the shortest day, the sun had set before I got to Renmark, and I had not booked anything. Now I know why some get so paranoid about booking things ahead. In this country, when you get outside the capital cities, accommodation is nowhere near as prolific or cheap as it is in the US. Did eventually find an affordable motel, but if I could not have, it would have been quite a way to the next place. Last edited by Southwest Dave; 06-08-2011 at 03:03 PM. Reason: Corrected highway number om request. Yes, it's a great read ! Knowing that planning your trips in detail prior to leaving is against your natural instincts, I had to chuckle when those plans went out the window almost immediately. Well at least the ones that were not left at home LOL ! 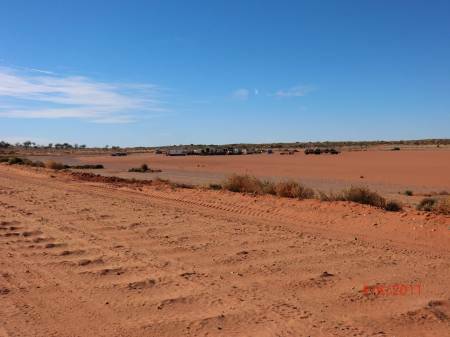 No readily available internet in Coober Pedy. Have just managed to get 30 mins at the Visitor Information Centre. So much to tell, so little time. I am writing it all up by hand (a pain) so that I can post when I get extended internet access again, but it may be a few days. ... those plans went out the window almost immediately. Yup Dave, and even more plans have gone out the window. I covered 966 kms yesterday, was on the road from 8am to 8pm, with a few stops scattered throughout the day. Am now off to see when I can get a flight over Lake Eyre, which after all, is the purpose of this trip. iPhone, iPad and Droid devices are the next big thing we'll add to this forum. If you have one of these devices, soon, very soon, (or not depending on the usual issues) you'll be able to update your forum posts from your phone on the road. In central Australia, that won't help. I discovered that people there use three ways to communicate - Landline, CB, and face to face. The locals contact their neighbours by CB. When asked for contact details, most of us put down our mobile. Not where I was, they give their channel. I don't think I saw a mobile phone on any of the locals. There is no other coverage than Telstra landlines. It is just too remote and too sparsely populated. it will live on somewhere else. 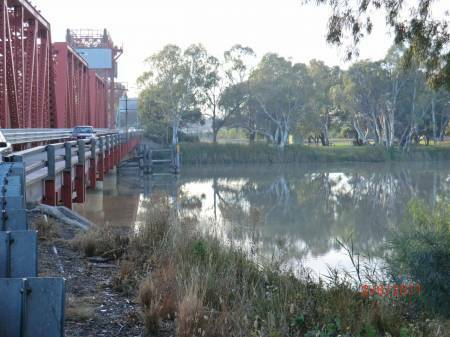 It was 8am, and I was ready to leave Paringa - across the river from Renmark. 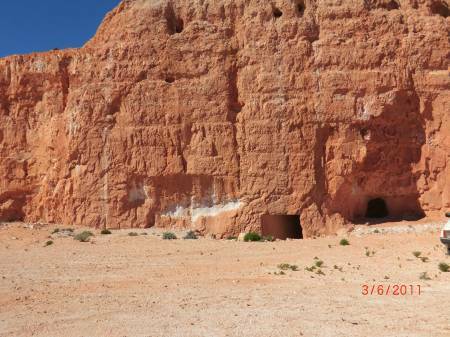 But before doing so, I figured I would call and book a bed in Cooper Pedy. 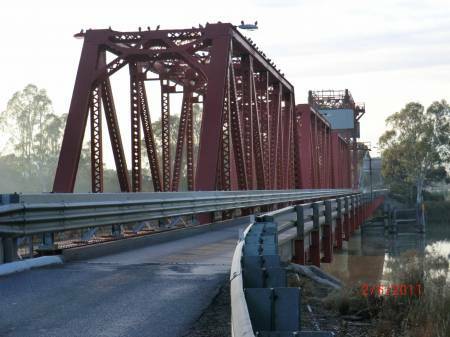 The Historic Bridge across the Murray river at this point, is a single lane in each direction, and still opens for craft to go up and down the river. Mainly paddlesteamers with tourist aboard, these days. But in the early days, this was a main trading route. When I look at the river which this bridge spans, I think of the Mississippi. The Murray, our mightiest river, is a mere trickle in comparison. I have often thought, if you were to take all the permanent waterways in Australia, and put them together they would not equal the volume of water which runs down that great river from MN to New Orleans. Chose not to follow the route computer mapping and my gps wanted me to go, but followed my map instead - through Morgan and onto Burra. From there I planned to go through Crystal Brook to Port Pirie, at which point I would once again pick up a main highway - albeit a single lane highway. It was about 25kms west of Morgan that I came across Boot Hill. I had been thinking of how much the surrounding countryside resembled northwestern Nevada, that corner up there, north and west of Winnemucca. And then to stumbled upon an icon (top) similar to the one Nevada lost, not all that long ago. I spent far too long there! 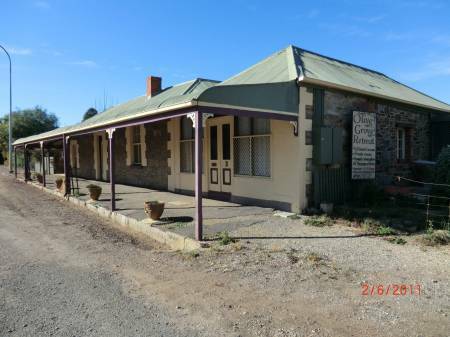 Burra is another of these historic towns, with most of the buildings made from local stone. Gave my Outback a well deserved drink in Burra, and learned that Coober Pedy was still 702 kms. By now it was 11am At my steady pace of 100kph (the speed limit is 110), it was going to be a long day. Decisions had to be made. By the time I got to Port Augusta I needed a break. All the heavy transport on the road was taking the enjoyment out of this drive. Here we do not have 18 wheelers, like in the US. Semi trailers typically have 22 wheels. But these trucks had 42, and then there was the ocassional one with 62 wheels. (I counted them while waiting at a traffic light.) Chose to take the meal I bought to the Native Botanical Gardens, just north of the town, and relaxed there in the midst of a great variety of native plants. 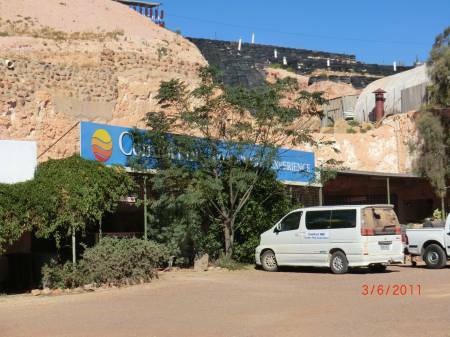 Coober Pedy was now 525 kms up the road, and only one more settlement between me and there. So, satisfied after a good break and a hearty meal, a bottle of water and having filled the tank once more, I set off on what to me, was going to be the most interesting of all highways... the Stuart Highway, the highway into the Outback (land that is, not the car). Nothing I read or researched indicated that there was anything more to see in this last stretch, other than black asphalt and desert. 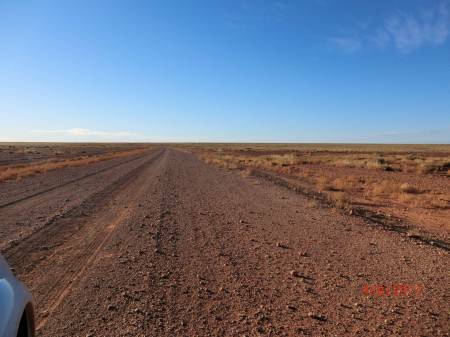 Even folk to whom I spoke, who had done this trek, said just to head straight for Coober Pedy. Yet, all the way along the highway there were pull-offs with camera indications. And I had to pass by all of them, for lack of time. Just as there had not been any indication that fuel was available anywhere other than at Woomera and my final destination. Yet I was able to fill up at Glendambo, some 113 kms further on from Woomera where I had forgotten to fill up. Not only that, but they had accommodation. The sun was close to setting, and I was regretting having booked in Coober Pedy. There are several rest areas along this last stretch, none of which are marked on maps. But then, rest areas are nothing like what most of you will have pictured in your mind's eye. Rest areas here are a large cleared area by the side of the road, unpaved and always has a 44 gallon drum for rubbish. Ocassionally they will have a (note! a!) table and seats, concreted into the ground. And even more rarely will they have a small wooden outhouse, longdrop toilet. But that is rare indeed! Lake Hart rest area is one of these. Furthermore, there is no restriction on spending the night at any of these places. As it was quite late, I noticed that all of the rest areas had some caravans, campers and tents already in them, but the one at Lake Hart had more than two dozen. It was like a little city. Eventually found the place where I had booked a room. 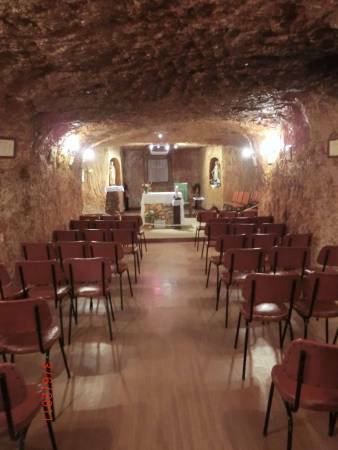 Like most of Coober Pedy, it is underground - actually in an old mine. Underground means walking into the side of a mound, and slightly down. The website said they have underground rooms and camping - there were lots of tents. Other facilities listed on the internet wereTV and Internet, as well as a camp kitchen. I should by now know that you do not believe all you read. I had paid for two nights, and next morning went in to get the second night's money refunded. For a person who will not go into caves, the whole atmosphere was claustrophobic. It was hot. And the room had a bed and a light. No power, not even a mirror. It was a long walk to the bathrooms, which were above ground. There was no external light anywhere, and the internet had been broken for 'months'. The so called camp kitchen was a single ring gas burner and BBQ. Not even a fridge! Despite their warnings of dire consequences, I cooked in my room (my Trangia always comes with me wherever I go), and I left my phone on charge in the bathroom - the only place with power outlets. A relaxing day. After having got my money back for the accommodation there was a visit to the visitor centre, to book the flight over the Lake, find new accommodation.... and use their free internet. At the Oasis Caravan Park I was able to get a single room cabin, right next to the amenities block, which included a very well equipped camp kitchen. And it was a lot cheaper! 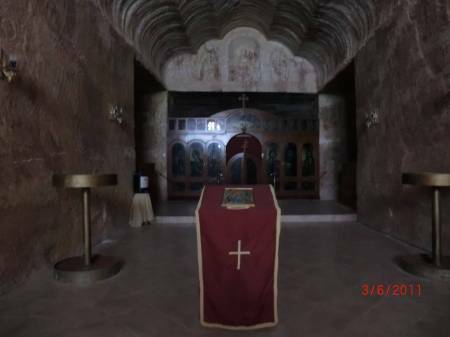 the Catholic Church - both underground. Most of the people live in what they call 'dug-outs', the underground homes. Most are not actually below street level, they are just dug out of the sides of the rocky hills. The town is only a half a dozen or so, streets long and wide, and the majority of businesses were selling opals. And yes, I did a little shopping. Then a little trip along the dirt roads outside the 'town' area, took me to a track which looked interesting. It was only short, up over a crest, and led to a small clearing - no larger than a small carpark - surrounded by low hills. Here I saw three dug-outs neatly next to each other, with front windows and doors and neat little fences. There had even been an attempt to make a bit of a garden in the rocky ground. 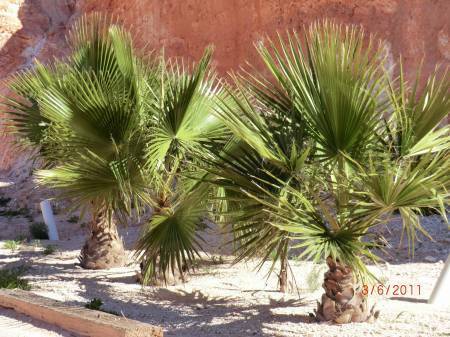 Three small palm trees were thriving. There were solar panels for power, but I was left wondering about their access to water. I was hoping someone would come out so I could ask some questions, but saw no sign of life. On the opposite side of this little clearing were a couple of mine entrances. The residents here appeared to be doing well. Tonight was the last of the meals I had brought from home. That Waeco I bought all those years ago has been worth every penny. An early night was in store. The flight was at 11am, and I was assured it was a two hour drive to William Creek. I was allowing myself three hours. But I had yet to get my tyres deflated for the rocky road ahead. 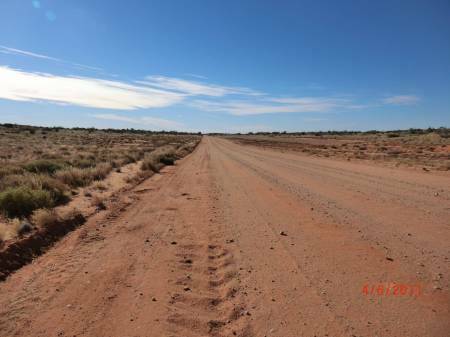 The William Creek Road turnoff is some four kms south of Coober Pedy, along the Stuart Highway. And even in this short distance, I was to be surprised. The sign on the back of the truck said 'Long Vehicle', as do all road-train vehicles. But I was not prepared to be overtaking an 82 wheeler.... yes!! Prime mover pulling four tankers. This would not have been possible only a couple of decades ago, before this road was sealed. I must admit, it left me flabberghasted! Poor William Creek Road is much maligned. Here too we are starting to see this paranoia about driving on unsurfaced roads. The sign virtually demanded you carry 2 spares; two jacks; plenty of water; blah; blah; blah!! Mind you, not a word about tyre pressure, let alone common sense. And as the man who has to fix all the flats, told me, 99% of flat tyres were over-inflated. His chart said that the Subaru desired 25psi on the front and 28psi on the back. I had been driving with new tyres inflated to well into the 30psi, on bitumen. Not that I would normally know. My little tyre man looks after that at least once a month. and discovered it to be quite a good road. and some washboarding. But on the whole, a good road. I stopped a few times to take photos, and when a truck came from the other direction, the cloud of dust was so dense that it set off my parking sensors. These plains were full of birdlife, and I thought what a wonderland it would be for birdwatchers. I am not sure if the abundance was due to the water in the Lake - still 150kms away - or the mice plague much of S.A. and western Victoria have been suffering. Many of the birds appeared to be birds of prey, and there were huge flocks of little finches. Along this road, as along so many of the roads in the area, you will sooner or later come to the 'Dog Fence'. 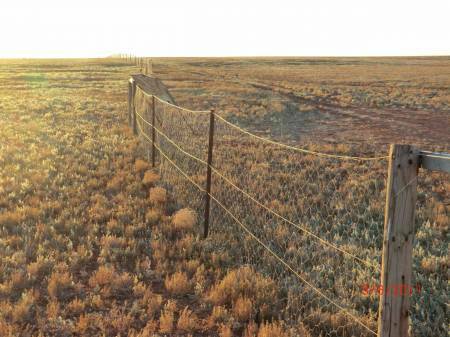 This is said to be the longest fence in the world, to keep the dingo out of sheep country, and prevent it from breeding with domestic dogs. Other than that, the trip was uneventful and I arrived with time to spare. The two hour flight was spectacular. There simply are not enough adjectives in the English language to describe it all. I shall leave the actual flight and Lake story for the next post, and tell it with the photos. Back at the William Creek hotel, after the flight, we were literally trying to come back down to earth. I chose to have a hearty lunch, and take the opportunity to download the several hundred photos I had taken, to my computer. Over lunch I got to chatting with another lone lady having lunch (as ye do). 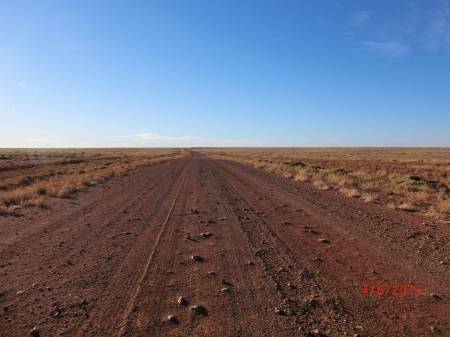 She was telling me how she had enjoyed Oodnadatta, and all the sights north and west of there. She assured me that the road was good, and there should be no reason for my Outback not to be able to make that journey. It was now 2.30pm, but seeing I was this far north, I may as well. It could mean having to skip Broken Hill, but that can wait till another day. 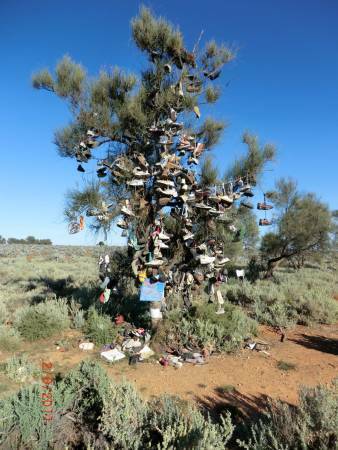 The Oodnadatta Track is one of the legendary tracks most nomads rave about. It goes back well into the 1800s when drovers took stock along this route to market. Doesn't look half as bad in the picture, not like it did there. And so it was that I came to Peake Creek. This was not a dry creek bed. 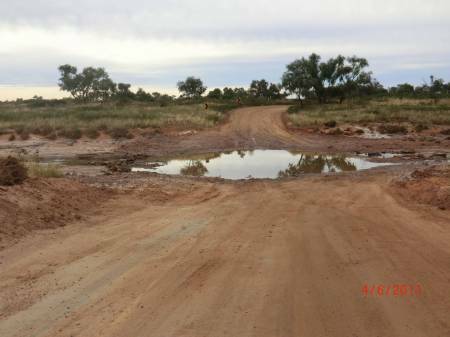 I had been assured that I would be fine - my vehicle would easily cross the gravel bottomed creek. Maybe I am no longer as adventurous as I used to be. I was on a road - Track - which saw 10 vehicles in three hours, and by now it was 4pm. It definitely is not a road ye wanna be on in the dark. And even though I was carrying an Epirb, I was not about to deliberately create a situation where I may need to use it. I turned around and headed back. I am not sure why, maybe it is because I was thinking of how I was going to explain this, but my computer came to mind. I glanced over to where I always keep it, and it was not there. I then realised I had left it in the dining room at the William Creek Hotel. When I hit a patch of loose sand far too fast, I realised I was panicking. The last thing I needed was an accident. Time to stop. Take some deep breaths, a drink of water, some nibblies from the pack and a walk - even if only around the car. At 5.45pm I arrived back in William Creek - the sun was just setting. And yes, they had found my computer, but when they did, I was already out of sight. And I was once again assured, by all the locals in the bar, that my Outback would have crossed that creek without a worry. A budget bed at William Creek Hotel for $35. Wifi was available for $20/hr! 256 kms; more than $40 in fuel; and over three hours wasted. Or was it? For me it was all part of a perfect day. Last edited by Lifemagician; 06-07-2011 at 06:13 AM. Glad the recovery of your computer went so well -- we're all enjoying the photos and the trip report!. Yes, I am really enjoying following your report and the pictures are great! 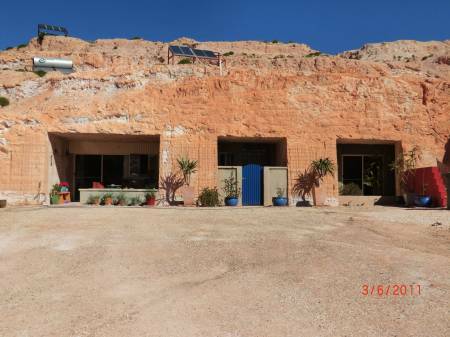 I had been 'following' you on Google maps and had looked up the 'Opal capital of the world' that is 'Coober Pedy'. Fascinating place, but be careful where you tread, we don't want you ending up being another statistic falling down one of those mine shafts !! By Ray Reynolds in forum Going to Las Vegas! By OzMINI in forum Gear-Up! By sohrab in forum Gear-Up!